Lush images and equally evocative writing mark a new profile of writer John Pritchard in Memphis Magazine, by Michael Flanagan with photographs by Brandon Dill. Flanagan, who knew Pritchard from when Flanagan was a student and Pritchard an English professor, let Pritchard take him on an intimate tour of the Mississippi Delta as only Pritchard could conjure; the Delta is also the setting of Pritchard’s first two acclaimed books, Junior Ray and The Yazoo Blues, and his new book forthcoming from NewSouth in October, Sailing to Alluvium. “He keeps a short ponytail and close-trimmed beard and you can find him in seersucker suits in the summer, and woolen knickers and stockings in the winter. He is genteel, raised in a society of manners, and speaks with an accent like fellow Deltan Shelby Foote — something that only adds to his charm. When you visit with him you feel as though you are being adopted into the world he comes from. But he is far from the provincial stereotype of the small-town world. John has lived in Memphis for more than 30 years, working as an English professor for most of that time. But the last eight years have changed things a little. Since the mid-2000s, John has won acclaim for two novels set in the Delta, which follow in the Southern literary legacy of Mark Twain, Flannery O’Connor, and John Kennedy Toole, but fall in a place of their own. The first of these, Junior Ray, was named one of Barnes and Noble’s “Sensational Debuts” in 2005, and the sequel, Yazoo Blues, was given a starred review by Publishers Weekly after its release in 2008. Pritchard himself was nominated for the 2009 fiction award by the Mississippi Institute of Arts and Letters. I asked John why he wanted to write about the Delta. Soon we come to the top of one long, high climb. Nail Road suddenly plummets and the horizon leaps miles away in the distance to the west. Through a proscenium of tree trunks and the shade of full boughs, a sun-filled tableau of farmland opens in a wide valley beneath us. And meeting this flatland, just below the horizon, is the Mississippi River. “There’s the Delta,” John says. He lets go of the steering wheel as we begin to descend, and lifts his hands into the air like a carnival-goer on a roller coaster. And we speed between rust-colored ravines, descending from the hills, and enter the Mississippi Delta. John Pritchard’s third book in the Junior Ray Saga, Sailing to Alluvium, will be published in October 2013. Download a preview of Sailing to Alluvium (PDF or eBook), or view the official book trailer. Read “Heart of Delta” in full at the Memphis Magazine website. The state of Connecticut has just declared local hero Gustave Whitehead to be the inventor of the airplane, claiming Whitehead flew in 1901, before the Wright Brothers first flew in 1903. Claims like this occasionally crop up, because many people were trying to invent the airplane around the time of the Wright Brothers. Wilbur Wright himself, inspired by their efforts, resolved to make his mark on the world by inventing the airplane. The key element is that he and his brother Orville actually did it, while others did not. Powered flight could not be achieved until a bunch of things came together. One crucial ingredient was full control of the airplane. Other experimenters understood they needed to control the up-and-down motion of aircraft and the right-and-left motion. However, others did not understand that they needed to master of the roll of the aircraft. An airplane needs to bank – tilt it on its wing – in order to maneuver successfully. The Wright Brothers figured that out. To the bicycle-building Wrights, it was natural to lean into a turn, just as bicyclists did. If Whitehead mastered that key aspect of control, he surely kept it secret. In contrast, once the Wrights mastered this aspect, all the other would-be flyers started copying them. The state of Connecticut also suggested that the Wright Brothers had a conspiracy with the Smithsonian to declare them the first to fly. That’s a joke. In reality, the Smithsonian’s director in the Wright Brothers era, Samuel Langley, was also trying to invent the airplane. His version plummeted dramatically into the Potomac a few days before the Wrights’ first successful flight at Kitty Hawk. Despite this, the Smithsonian declared that Langley had invented the airplane. The claim was preposterous, so Orville Wright refused to allow the actual first airplane to be exhibited in the Smithsonian until the institution admitted that the Wrights had, indeed, flown first. Much has been written on Whitehead’s supposed flights and witnesses who saw him fly. As mentioned above, such claims are frequent. Many in Alabama believe that Dr. Lewis Archer Boswell, whose plantation is now the location of the Talladega Superspeedway, flew in 1894. He also had lots of supposed witnesses. And yet, his aircraft remains a mystery. Perhaps he built a model. Perhaps he built a glider. Either would look quite dramatic to people who had never seen an airplane, and stories of such a craft could quite easily be magnified to match the Wright Flyer when the Wright Brothers were successful. The Wright Brothers spent part of 1910 in Montgomery, Alabama, where they established the nation’s first civilian flying school and where their students flew the first night flights in the world. And yet, shortly before the Wright Brothers arrived in Alabama, a Birmingham resident claimed to have built an airplane and to have flown it many times at night, with multiple witnesses. The man even promised he was going to start an airline passenger service between Alabama and Washington, DC. Of course he didn’t do so, because his story was made up. And yet, a reader of the newspaper account might have believed it and repeated it as truth later. There’s no telling what people in Connecticut actually saw – a glider or a toy model, perhaps. But if they did indeed see a successful airplane invented by Whitehead, it would seem that Whitehead had very little understanding of getting the word out or of explaining to others how it could be done. It seems a strong possibility that he didn’t do so simply because he hadn’t really mastered flight at all. 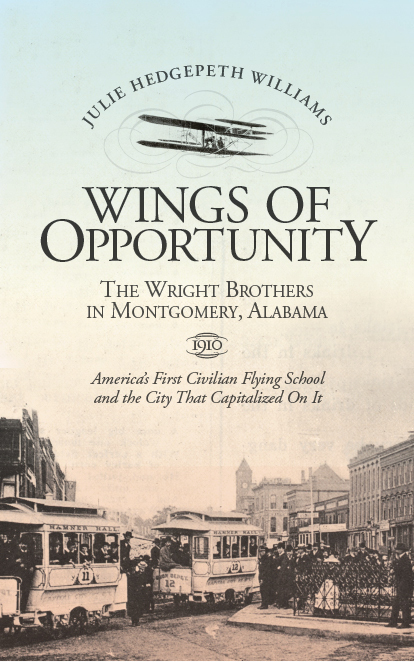 Julie Williams’s Wings of Opportunity: The Wright Brothers in Montgomery, Alabama, 1910 is available from NewSouth Books, Amazon, or your favorite bookstore. Williams’s most recent book is A Rare Titanic Family: The Caldwells’ Story of Survival, about her relatives who survived the sinking of the Titanic. Two NewSouth Books authors came together recently when syndicated columnist Rheta Grimsley Johnson (Hank Hung the Moon, 2012) attended writer Frye Gaillard’s April 10 event at Eclipse Coffee and Books in Montevallo, Alabama. 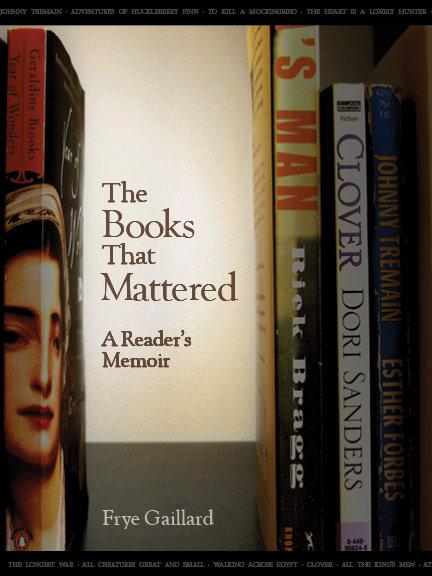 Gaillard was there to talk about his new book The Books That Mattered: A Reader’s Memoir. In The Books That Mattered, Gaillard relates the books that shaped his life, from Esther Forbes’s novel Johnny Tremain that first sparked Gaillard’s interest in reading, to classics by Charles Dickens and Mark Twain and the work of Harper Lee, Robert Penn Warren, and John Steinbeck; to newer books by Rick Bragg, Sena Jeter Naslund, Geraldine Brooks, and others. After Gaillard spoke, the audience took turns relating some of their favorite books and authors, and how those books had shaped them. and the audience took turns describing their favorite books and books that had influenced their lives, as Gaillard does in his memoir. “Fourth grade,” Johnson notes, “seemed to be the most popular year for life-altering trips to the library. Gaillard’s talk inspired Johnson to muse about her own life-changing reads. Johnson concludes that while she agrees with many of the choices Gaillard mentions in The Books That Mattered, she recognizes Frye’s “hope … not that we will adopt the same favorite books, swayed by his elegant telling of their back stories, but that we will ‘create an equally personal list,'” as Johnson did. Frye Gaillard’s The Books that Mattered is available from NewSouth Books, Amazon, or your favorite bookstore. You are currently browsing the NewSouth Books weblog archives for June, 2013.